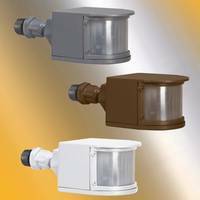 New 5639 series Weatherproof Motion Sensor is available in gray, white or bronze and is suitable for use in residential, commercial and light industrial applications. Unit comes with control for motion detection range, light sensitivity and light duration. Unit allows the adjustment of motion range from 0-20 m and timing of light duration from 2 seconds to 1.5 hours and provides 180° field of view for sensing motion. 5639 series sensor meets NEC and NEMA 3R standards and comes with standard 1/2 in. threaded mount. Bell's 5639 series sensor features controls for motion detection range, light sensitivity and light duration. It offers a 180° field of view for sensing motion. A patented multi-directional swivel joint allows for easy adjustment. Control settings may be adjusted on the bottom of the unit. Motion range can be set from 0-65 feet (0-20m). Timing for light duration can be adjusted from 2 seconds to 1.5 hours. Photocell sensitivity can also be fine-tuned. Compatible with LED lights, the sensor is designed for use with round or square box mounted floodlights. It includes a standard 1/2in. threaded mount. The UL Listed 120VAC device is NEC and NEMA 3R compliant. The 5639 series is available in Gray, White or Bronze. It is ideal for use in residential, commercial and light industrial applications. The Bell 5639 series Weatherproof Motion Sensor Switch is available now. Find more information at www.hubbell.com. Follow the brand on LinkedIn and Twitter.